From left, Director of Ombudsman Services for Mass. 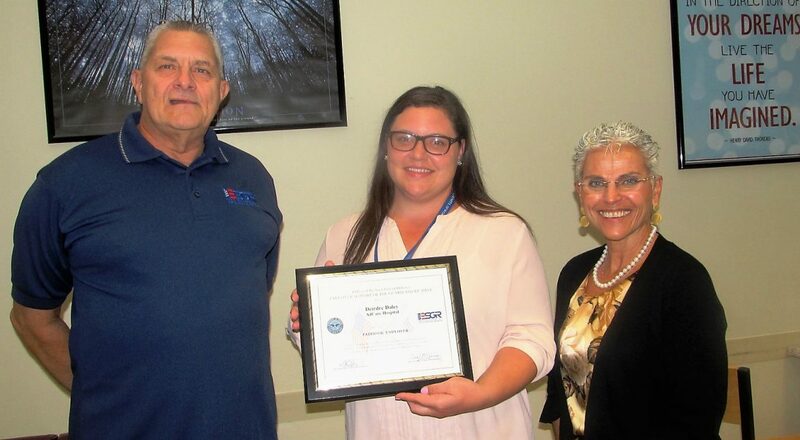 Employer Support of the Guard and Reserve Richard Bedell is pictured with AdCare Worcester Outpatient Supervisor and Recipient of the Patriot Award Deirdre Daley and Joan Bertrand, vice president of Human Resources at AdCare. The Center for Applied Behavioral Instruction, an accredited, private special education day school for students with autism spectrum disorder and challenging behaviors in Worcester, has relocated to an adjacent building at 345 Greenwood St., Suite 3. An open house will be held 4-6 p.m. Friday at the new location. There will be a ribbon-cutting ceremony with officials from the Worcester Regional Chamber of Commerce. CABI staff will conduct tours of the facility. CABI previously resided at 345A Greenwood St., occupying roughly 4,000 square feet. It recently doubled its enrollment and the new location enables the center to expand and increase capacity. The school is accepting applications for students ages 6 through 22 who reside in communities within a one-hour radius of Worcester. CABI was founded in 2013 by the school’s directors, Jeffrey Robinson and Brian Doyle, who have more than 60 years of cumulative autism and ABA experience. Robinson and Doyle utilize a hands-on approach to the operation of the school and education of the students, providing direct supervision of all academic and behavioral instruction developed and implemented by the highly credentialed staff. Worcester radio station WCUW-FM 91.3 and Joe Mangiacotti announced the creation and launch of Pride Radio with Joe Mangiacotti. Pride Radio will debut at 3 p.m. Monday, Nov. 20. The first show will coincide with Transgender Day of Remembrance, a day to memorialize those who have been murdered as a result of transphobia and to bring attention to the continued violence endured by the transgender community. Mangiacotti, the host, began in radio in 1986 and has held many positions at radio stations throughout New England. “The issues and what is important to the LGBTQ community is often not considered or often misunderstood and therefore misreported … and we can set the record straight — no pun intended, ” Mangiacotti said. “I would like to take my experience and my activism in the LGBTQ+ community to launch Pride Radio. This is programming that is both needed and in demand. Given the current atmosphere and the continued struggle it’s important we have a platform. We will look at the LGBTQ+ community and will educate, entertain and make our listeners aware of what the political, social and legal issues are today,” Mangiacotti said. 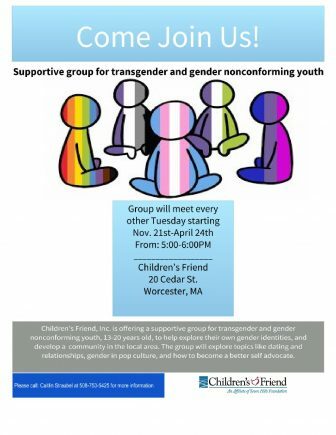 Children’s Friend is offering a support group for transgender and gender nonconforming youth 13 to 20 years old. The group will help members explore their gender identities and develop a community in the local area. The group will also discuss dating and relationships, gender in popular culture and how to become a better self advocate. The group will meet 5-6 p.m. Tuesdays Nov. 21-April 4 at Children’s Friend, 20 Cedar St.
For more information, contact Caitlin Straubel at 508-753-5425. Before leaving for active military duty with the U.S. Naval Reserve, AdCare Worcester Outpatient Clinician Robert Adu-Boahene nominated his supervisor, Deirdre Dale, for the “My Boss is a Patriot” Award. The Patriot Award honors the efforts of employers who support citizen soldiers in their employ by holding their positions during their deployment and granting leaves of absence if needed, according to Richard Bedell, director of ombudsman services for Massachusetts Employer Support of the Guard and Reserve, who recently was on hand to present the award to Dale. “AdCare is proud to support those employees who give of themselves to serve in our Community, our Military and National Guard,” AdCare VP of Human Resources Joan Bertrand said. RTN Federal Credit Union, which has a Worcester branch at 530 Grafton St., once again has earned BauerFinancial’s 5-Star Superior rating for financial strength and security. RTN has retained this top ranking for 89 consecutive quarters, putting it in an even more prominent position as an “Exceptional Performance Credit Union.” This designation is reserved for financial institutions that have maintained the 5-Star rating for at least 10 straight years.